Front impact bicycle accidents comprise a disproportionate number of crashes causing serious injury or death every year. Choosing to ride bicycles instead of driving motor vehicles is both healthier for the cyclists and better for the environment. Bicyclists face heightened risks of being seriously injured in collisions with motor vehicles, and it is important that they take precautionary measures to minimize their risks. Unlike the occupants of motor vehicles, cyclists do not have a protective metal frame that surrounds them and absorbs some of the physical forces that are released in accidents. This means that they are much likelier to suffer catastrophic injuries when they are struck by vehicles. Of all of the different bicycle accident scenarios, being struck by the front of a car or other motor vehicle is the most common type of auto versus bike crash as well as the type that is the likeliest to cause death or serious injury according to recent studies. Researchers with the German Insurers Accident Research, or UDV, reviewed data of bicycle versus car collisions in Germany from 2002 to 2010 that resulted in personal injuries and fatalities. The researchers looked at various accident scenarios that may occur, including bicycles colliding with cars at the front of the vehicles, the left side of the vehicles, the right side of the vehicles and the rear of the vehicles. Out of the 407 accidents that were included, it was possible for the researchers to determine the location of the vehicles involved in the collision with the bicycles in 356. Sixty-one percent of the collisions happened at the front of the vehicles, 15 percent occurred on the left side of the vehicles, 20 percent happened on the right side of the vehicles and 4 percent happened at the rear of the vehicles. When the researchers compared the maximum severity of injuries to the area on the vehicles, they found that 84 percent of the victims who suffered the most severe injuries were struck by the front of the vehicles. There are numerous scenarios in which a motor vehicle versus bicycle collision can happen. Here are five common scenarios in which these accidents may happen. In this type of bicycle vs. car collision, a motorist pulls out of a driveway or from a side street, colliding into an oncoming cyclist that the motorist failed to notice. Under California Vehicle Code § 21804, all motorists are supposed to yield the right-of-way to oncoming traffic before entering a road from a side street or driveway, including cyclists. Cyclists may minimize this risk by riding further left on the roads and waving their arms or taking other actions to get an inattentive driver’s attention. A driver who fails to look both ways and who strikes an oncoming bicycle rider is likely to be liable in a resulting personal injury lawsuit. Another common accident scenario happens when a motorist is turning right and strikes a cyclist who is riding across the street through a crosswalk. Cyclists are considered to be operating moving vehicles and are thus subject to the same rules as motorists under CVC 21200(a), including not crossing the streets in crosswalks. Bicyclists who are struck in crosswalks while they are riding their bicycles may bear some fault for causing their own accidents. Cyclists should instead cross the street with traffic on the right side of the road but to the left of any crosswalk. Some front-of-the-vehicle bicycle crashes happen when cyclists ride their bicycles while they are facing oncoming traffic. As previously mentioned, cyclists are expected to follow all of the applicable traffic laws. When wrong-way accidents happen, the bicyclists will be at fault for their accidents in most instances due to not traveling with the proper flow of traffic. Always riding with traffic and as far right as possible is good safety practice for cyclists. In this front-end bicycle crash scenario, a motorist decides to turn left onto a side street or into a driveway, colliding into an oncoming cyclist that the driver failed to see. This is similar to the red-cross accidents that were previously described, and the motorists are likely to be found to be at fault. In fact, California Vehicle Code section 21801 mandates that all drivers turning left yield the right of way to any oncoming “vehicles”, which include bicycles. These accidents may happen when a vehicle passes a cyclist and then suddenly turns right onto a street, crashing into the cyclist. This type of accident occurs because the motorist misjudges the speed of the cyclist. The motorist would likely be held to be liable because of making an improper turn under the California Vehicle Code or held liable for a bodily injury claim due to general negligence in failing to observe the cyclist prior to making the move to the right. Being injured in a bicycle accident may leave you with debilitating injuries that may impact you for the rest of your life. If you were struck by a car, you may need legal help to assert your rights. 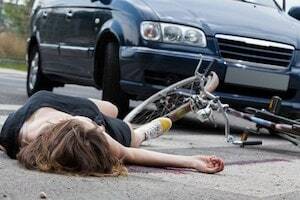 An experienced bicycle accident lawyer in Los Angeles may build a strong case that proves the liability of the motorist so that you may be likelier to be fairly compensated for your losses. Contact a personal injury lawyer today for help with your bicycle accident. German Insurers Accident Research, Cyclist-car accidents – Their consequences for cyclists and typical accident scenarios,” Matthias Kuehn, Thomas Hummel and Antje Lang.